Homer’s career as a commercial illustrator was in full bloom when he was tasked with illustrating John Esten Cooke’s novel Surry of Eagle’s-Nest; or The Memoirs of a Staff-Officer Serving in Virginia, a gripping and romantic tale of the Civil War. A native of Virginia, Cooke was a voracious consumer of the popular literature of his day—including works by Sir Walter Scott, Washington Irving, and Alfred, Lord Tennyson. He fought for the Confederacy during the Civil War, initially with the 1st Company Richmond Artillery, and later as an aid to cavalry commander J.E.B. Stuart. Surry of Eagle’s-Nest draws on his war experiences as well as his taste for romantic literature, and his post-war novels strive to reconcile the gritty reality of Civil War combat with the swashbuckling chivalry of Ivanhoe and Rob Roy. This same attempt at reconciliation is, to a certain extent, visible in Homer’s illustrations. Gone are the large-scale depictions of hectic battle sequences found in Homer’s work for Harper’s Weekly. Instead, his illustrations for Surry of Eagle’s-Nest feature sabres, plumed hats, and capes. 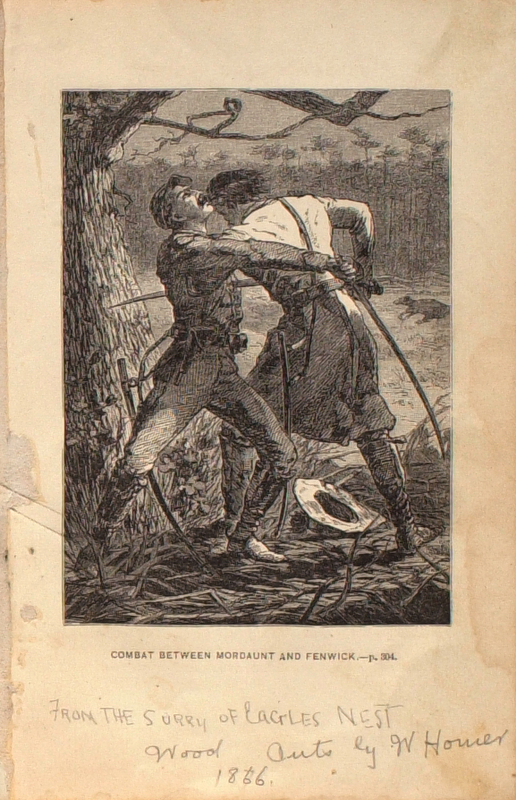 If the caption to Gen. Jackson’s Escape were deleted, the illustration could be used in any number of Romantic war novels. These illustrations are more cavalier, in every sense of the word, than the majority of Homer’s Civil War work. The collaboration of a New York-based artist and a Virginian novelist the year after the Treaty of Appomattox was signed shows just how swiftly some elements of reunification proceeded. However, the fact that a novel that unrepentantly glorified the Confederacy was immensely popular all over the country is in turn a testament to how slowly other aspects of reunification progressed.